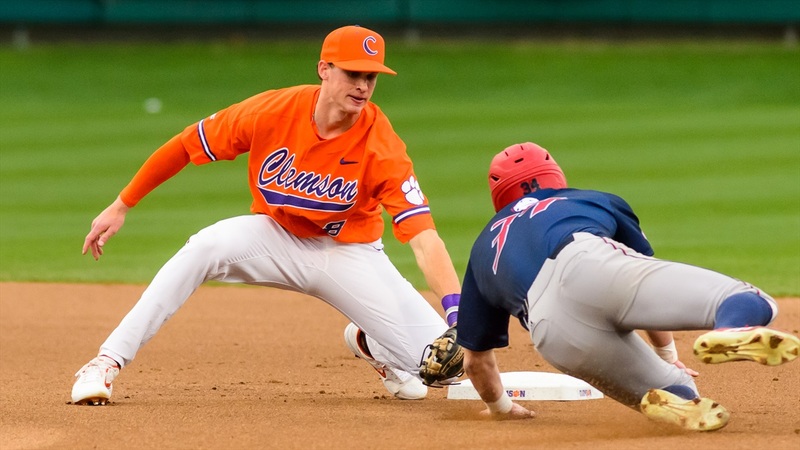 CLEMSON, S.C. - Junior shortstop Logan Davidson (Charlotte, N.C.) was one of 40 players named to the Golden Spikes Award midseason watch list on Wednesday. The award is presented each year by USA Baseball to the national player-of-the-year. In 2019, Davidson is hitting .309 with 28 runs, eight doubles, one triple, nine homers, 32 RBIs, a .610 slugging percentage, .424 on-base percentage and 11 steals in 32 games. He also has reached base in 29 straight games and has a .962 fielding percentage on the season. The two-time All-ACC Academic selection has 144 runs, 35 doubles, one triple, 36 homers, 119 RBIs, a .404 on-base percentage and 31 steals in his three seasons as a Tiger.